Medics carry off one of the fatalities after a suicide bombing by a Palestinian terrorist in Netanya on Dec. 5. Another Palestinian suicide bombing has sown tragedy in Israel and raised the stakes in a national leadership race. 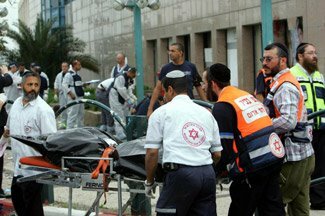 An Islamic Jihad terrorist blew himself up Monday outside the Sharon Mall in Netanya, which has seen several such attacks due to its proximity to the West Bank. At least five people were killed and more than 50 wounded. The bomber was identified as a 21-year-old man from the West Bank. Israeli Prime Minister Ariel Sharon, already under pressure following a weekend of rocket salvoes into Israel from the Gaza Strip, convened his government’s top brass for consultations. Guards identified the bomber as a potential terrorist as he approached the mall around 11:30 a.m., and pinned him against the wall. But he managed to detonate explosives in his bag, killing a security guard and several other people nearby. "The fact that the security guard and policemen managed to identify the bomber meant that they prevented a major disaster," Israel Police Commissioner Moshe Karadi said. Netanya Mayor Miriam Fierberg said the day started out as a perfect one for her city. The weather was unseasonably warm and she was hosting a party at city hall celebrating the decision by Elbit, a major Israeli high-tech firm, to move to Netanya. Then her cell phone rang and she got word of the attack. "This is the way we have to live here and to cope," she said in a conference call with Jewish federation officials in Cincinnati, Netanya's sister city, between visits to the hospital to check on the wounded. It was the third attack on the shopping mall, Fierberg said. The mall presents an attractive target because it is at the entrance to the city, and the facilitators who drop off the bombers are able to make a quick getaway. Netanya is located close to Israel’s pre-1967 border with the Palestinian territories. The Israel Defense Forces was preparing Monday evening for a wide-spread retaliatory operation in the West Bank and strikes in the Gaza Strip. Ha'aretz reported that the operation could last up to a month. Defense Minister Shaul Mofaz ordered security forces to wage an intensified crackdown on Islamic Jihad in the northern West Bank. Reinforced army units are expected to reoccupy villages where Islamic Jihad terrorists are hiding. The army will also severely restrict travel in the West Bank, and Israel has clamped a near-complete closure on the territories, the Jerusalem Post reported. The U.S. State Department said the attack underscored the need for the Palestinian Authority and Syria, which hosts Islamic Jihad, to crack down on terrorist groups. "The Palestinian Authority must take immediate steps to prevent these attacks, to end the violence, and to dismantle the infrastructure of terrorism," spokesman Adam Ereli said Monday. Sensing that the situation could spiral out of control, Palestinian Authority President Mahmoud Abbas condemned the Netanya bombing and pledged to arrest those responsible. But belying Abbas' words, Islamic Jihad held a press conference in Gaza City, which is under full P.A. control, to celebrate the attack. Sharon's right-wing rivals in the Likud Party - which he left last month, founding a new, centrist party to compete in March 28 general elections - lost no time in condemning him. "Thanks to Sharon, we risk seeing a terror base being created right next to the Dan region," legislator Uzi Landau told reporters. "Today's terror attack is only a sign of things to come." Landau withdrew from the Likud primary race Monday to endorse the front-runner, Benjamin Netanyahu. Other candidates include Foreign Minister Silvan Shalom and Mofaz. Sharon's new Kadima Party also faces a challenge from the left, from Labor Party leader Amir Peretz. A former trade union chief with little experience in making war or peace, Peretz was quick to call for an "all-out crackdown on terror." But he also has appealed to Israeli doves by vowing that, if he’s elected prime minister, he’ll withdraw from large areas of the West Bank. Sharon has a strong lead in popularity polls, thanks in large part to his alliance with veteran diplomat Shimon Peres, who left Labor last week after losing a leadership primary to Peretz. When he was Labor chairman, Peres helped Sharon push through the Israeli withdrawal from the Gaza Strip this summer, a move intended to kick-start moribund peace efforts with the Palestinians. But there have been two suicide bombings since the pullout, as well as salvoes of rocket fire from Gaza at Israeli border towns. The latter tactic appears to be extending its reach. On Saturday, two rockets struck Shuva, a moshav five miles from the Gaza boundary that had not been hit until now. Mofaz ordered a resumption of air strikes aimed at killing Palestinian terrorists involve in producing and launching rockets.